Microsoft and the Office 365 Patterns and Practices are out with more information about how and why you should move to the SharePoint App model instead of full trust SharePoint solutions etc. 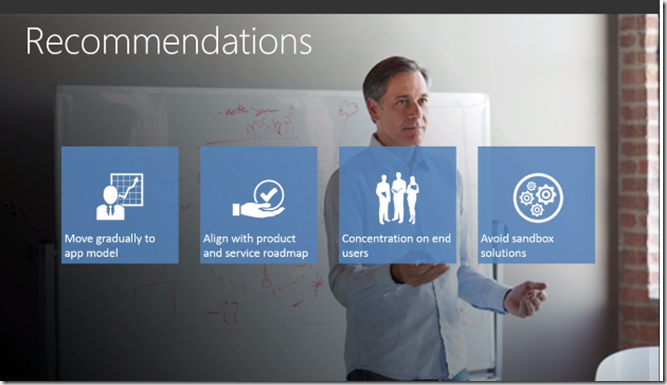 There is a new free course out on Microsoft Virtual Academy, Transform SharePoint Customizations to SharePoint App Model. the course goes through why you should think about moving your full trust SharePoint solutions to the SharePoint App model, or at least think about this approach for new solution. Microsoft have clearly paved the road here so I think there should be no confusion about the direction to take for SharePoint developers. The tools for doing app development are still not very mature compared to the stuff we have received over the years for full trust solutions, but I guess that will change in the future. It is still a pain and more time consuming to do Apps compared to Full trust or sandboxed solutions but as we gain more experience and the tools are getting better I guess this will change.